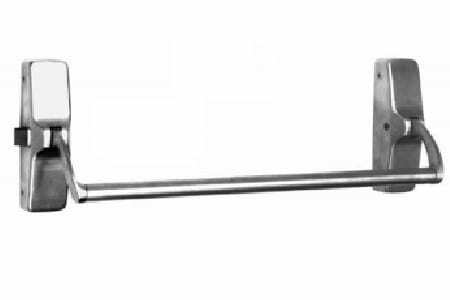 Exit device is designed to provide fast and easy egress to allow building occupants to exit safely in an emergency. Need a panic device installed at your property? We can install panic devices and other push entry bars or systems for commercial and industrial clients. Panic hardware, also known as an exit device, is designed to provide building occupants fast and easy egress in an emergency. Because of its durability and ease of use, panic hardware is commonly installed in places where it isn’t required by code. But despite its popularity, the question, “When is panic hardware required by code?” is one that many specifiers continually struggle with because there is no simple answer to this seemingly simple question. There are three basic types of panic hardware, dependent on aesthetic requirements, door design, and a few other factors. is a very secure application for pairs of doors, because the alignment of the doors is less critical than it is with vertical rod devices. A key-removable mullion makes the mullion easy for authorized users to remove when the full width of the opening is needed. The crossbar style is often used when aesthetics dictate a minimal silhouette for glass doors, or a vintage look, but the electrified options are sometimes limited because of the lack of space in the device to house electronic components. The touchpad style is the most common style used for modern buildings and allows flexibility when electrified options such as electrified lever trim, electric latch retraction, delayed egress, or controlled egress are required. Recessed panic hardware reduces the projection of the hardware from the face of the door, but requires a cut-out in the door and may limit the door material to hollow metal. Mortise – A mortise panic device has a mortise lock body which is installed in the door, with the panic hardware mounted on the door face but controlling the mortise lock. Mortise panics are less commonly used than rim panics, likely because of the more complex door preparation and product design. 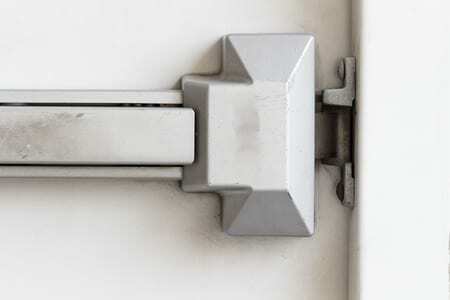 For fire rated pairs with a 3-hour label, mortise fire exit hardware is sometimes used in conjunction with vertical rod fire exit hardware on the other leaf, but some manufacturers have successfully tested their products for 3 hours with vertical rod fire exit hardware on both leaves. Switching between Right and Left Handed. Panic Bar with electric strike. Strike Top of Door Frame. Resize Bar. Handle and Strike. Dogging. Floor Keeper. Latch and Strike. Top Frame Strike. Switching Mound. Strike Top of Doorframe Explained. Key Release from Outside. Outside Handle(optional) Safety Feature. 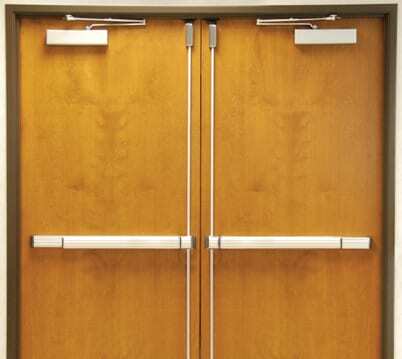 In this photo you can see door closers with exit devices (push bar) on double wood doors, Door closer are designed to give lasting, dependable service where surface applied units and other types of closers are not suitable, or would interfere with the architectural design. It can be easily installed in wood, aluminum, or hollow metal doors and frames, for single and double-acting doors. Are panic bars required on exit doors? 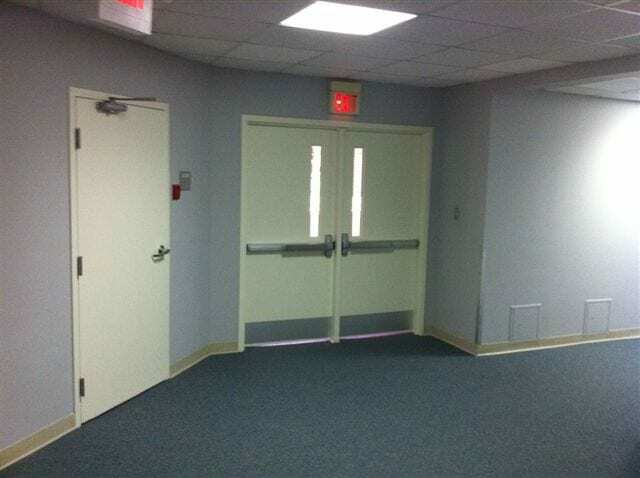 The IBC 2006 and 2009 editions – requires Panic Hardware and/or Fire Exit Hardware on egress doors with an occupant load of 50 people or more in the following occupancies: Educational. What is a panic bar on a door? 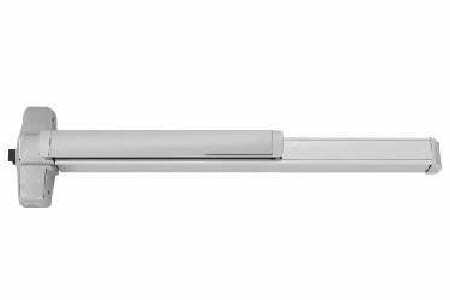 Crash bar (also known as a panic exit device, panic bar, or push bar) is a type of door opening mechanism which allows users to open a door by pushing a bar. How do you lock a push bar door? To unlock any of the exterior doors, first press and hold the push bar in. Next, insert the hex key into the small hole to the left of the bar, and twist it so that you hear a click. When you release the bar it should remain pushed in. To lock the doors, simply put the hex key in the hole and twist the other direction. 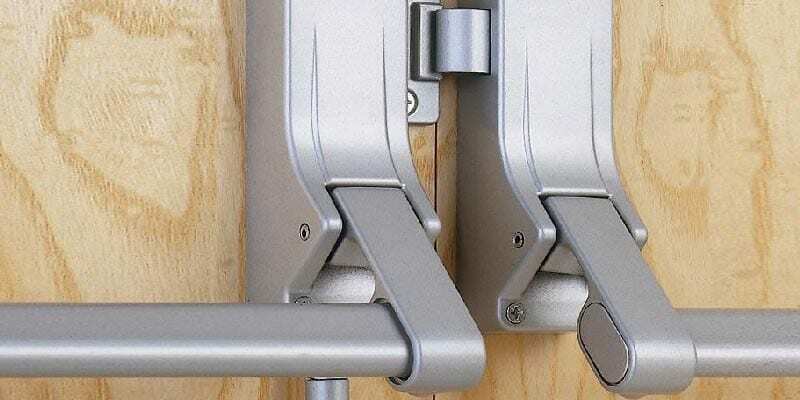 What is fire exit hardware? Panic Hardware and Fire Exit Hardware are two different types of exit devices, and the proper selection is determined by code requirements. 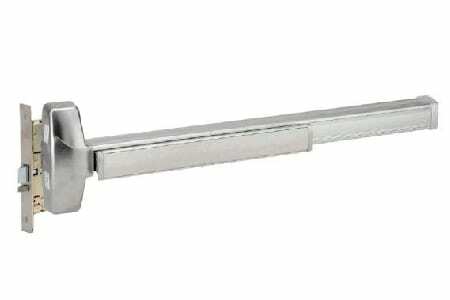 Panic Hardware is an exit device which is tested for use on a door that is required to have panic hardware, but cannot be used on a fire door. What is the panic hardware? Are there any requirments to use them? What is the difference between Exit Device and Crash Bars? For all that and more please visit thae Panic Hardware Page.